Ryan writes: Let’s talk about getting on the important side – the “looked-at” side – of the students’ devices. I offer suggestions that I act on to make learning more attractive for my Saudi Digital Natives using Quizlet & other great apps. This is a flipped presentation! Please preview my Quick Quizlet Prezi below – four short (less than 3 minutes each) YouTubes introducing the app with step-by-step creation & a sample of lesson delivery. Also, here’s my Tablet Technology for Teachers Prezi with a screenshot step-by-step of other tablet-mediated teaching tools, including Bluetooth, Google Keep, Merriam Webster Dictionary, SimpleDifferent Website Builder & Socrative. Some were interested in contrasting engaging students with mobile technologies with the interactive activities that Robert Wachman, one of our participants, developed decades ago (with Larry Staten) as part of LAEI (Live Action English Interactive). In the chat, Robert directed us to cpli.net, which is the website for Command Performance Language Institute. Here’s a link to a movie showing how a whole unit works. Unfortunately, one can’t actually do it themselves online, just see how it works. They are looking into creating an app for the software, but that’s still in the future. And here’s a link to a demo movie of a unit for the newer More Live Action English Interactive, but first one really shows the kind of exercise we were talking about: dragging an object to a window and triggering the playing of a video clip if it’s the correct object. some ideas on how to use Gamification. 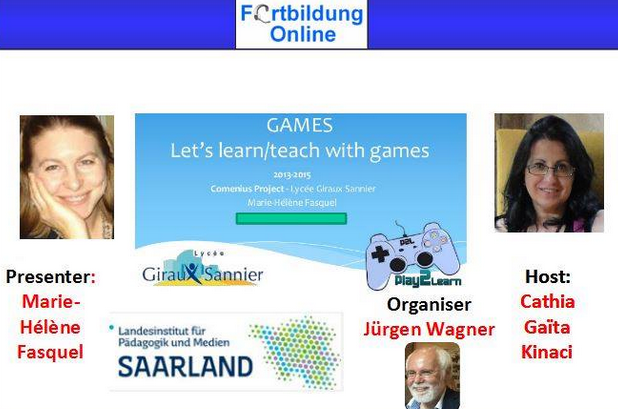 This Gamification webinar is followed by a 5-minute professional development presentation for teachers of English or other languages as a second language (Webinar in English). Marie-Hélène presented Scoop.it as an excellent Curation of Contents tool (Juergen’s Scoop.its). Teachers Micro Teaching in Pairs’. The class will start at 09:00 PM(GMT+04:00) Abu Dhabi, Muscat. VoiceThread is a cloud-based tool that can be used in a variety of formats to present material, comment of material or for discussion. Basic accounts are free and offer an excellent opportunity for students and faculty to learn through a non-linear format. Take a tour of VoiceThread, learn about its features and discuss possibly scenarios for application of VoiceThread in your own classroom. More information and session details are at http://live.classroom20.com. If you’re new to the Classroom 2.0 LIVE! show you might want to spend a few minutes viewing the screencast on the homepage to learn how we use Blackboard Collaborate, and navigate the site. Each show begins at 12pm Eastern (GMT-5) and may be accessed in Blackboard Collaborate directly using the following Classroom 2.0 LIVE! link athttp://tinyurl.com/cr20live. All webinars are closed captioned. Unsure of the time in your time zone? Click on the “Time Zone Conversion” link on our home page. On the Classroom 2.0 LIVE! site (http://live.classroom20.com) you’ll find the recordings and Livebinder from our recent ”20 Need-to-Know Features of GAFE You Should Be Using Today” session with our special guest Lisa Thumann. Click on the Archives and Resources tab. When tweeting about Classroom 2.0 LIVE, be sure to use #liveclass20. Special thanks to our sponsors The Learning Revolution, Weebly, and Blackboard Collaborate! Tue Nov 25 19:38 GMT: Jason R. Levine on ‘WizIQ test class’. The class will start at 11:38 PM(GMT+04:00) Abu Dhabi, Muscat and is 60 minutes long.